I walked away from driving about two years ago. I’ve never really enjoyed driving. I have always been a nervous driver, afraid that I will zig when a zag is called for. Several near misses during my driving days amplified that fear. I think the problem may have started on a Sunday drive when I was a young teen. One Sunday my parents decided to drive to Rochester to visit my stepfather’s sisters. I was thirteen and couldn’t think of anything more boring than visiting Dad’s spinster sisters, so my folks let me stay home. My best friend came over to spend the afternoon and after they left, I proudly showed her my family’s new car. 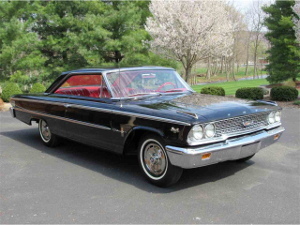 The 1963 Ford Galaxy, although a year old, was the newest car that either of my parents had ever owned. It was shiny, black, beautiful, and still so new that my folks were afraid to drive it very far so they drove my Dad’s older car to Rochester. Vicki was visibly impressed. “We ought to take it for a spin,” she said. “I know how to shift,” she replied. “I can shift if you can steer and do the pedals.” Vicki’s dad was the best mechanic in our small town of 1500 and I didn’t doubt she knew how to shift. The idea was tempting. Too tempting. How hard could it be? My Mom wasn’t much taller than me and she drove all the time. If I could steer my bike, I could steer the car, couldn’t I? After all, it had four wheels, instead of just two. I went inside and retrieved the spare key from the key rack and off we went. Vicki told me to put the clutch in and let it out slowly when she had the car in gear. It took a couple starts and stops but I finally got going. I slowly navigated the two blocks up to the highway stop sign. In our small rural town, Sundays were usually pretty quiet. There was no traffic as I carefully made a right turn and drove the quarter mile to the town's only service road. The gravel was a bit more unstable than the highway pavement had been. After a couple minor slips, I was ready to turn around and go home. But turn where? Finally I approached another road, where I could turn right (the only way I had ever turned). I left off the gas, but Vicki screamed, “You’re going too fast!” We never really found out if she was right about that because she grabbed the wheel and pushed it to the left. 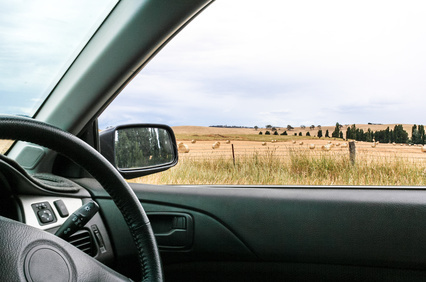 The car left the road, hit the ditch, and went on to collide with a barbed wire fence and the metal fence post that had held the fence in place. However, neither Vicki nor I were going to get by unscathed. As the farmer pulled the Galaxy from the ditch, a steady parade of vehicles appeared from town. Vicki and I were the village's Sunday afternoon entertainment! All we could hope to do is hope to hide the damage to the car as well as possible. Shaking with nerves, fear, and remorse, I carefully drove the car back home. Together, we worked at backing the car into a spot as close as we could to its original spot. Surprisingly, there were no dents in the vehicle. The hood, though, had several long scratches from the barbed wire. Black shoe polish and magic marker did a fair cover-up … or so we thought. The next day, after school, my mother met me at the door. She told me that I was grounded for a month, but for now, she had made arrangements with Vicki’s folks for me to stay there until my Dad had “cooled off.” It seems the town was buzzing with our Sunday escapade. I survived my parents anger. They were pretty quiet around me for a couple of weeks. I have always thought they both showed great restraint. It was one of those situations when a child truly believes her parents will kill her and she is quite amazed when they don’t. Needless to say, I was done driving until after I was old enough to take Driver’s Education, but that’s another story.